A lot goes through your head waiting to start your first 50 K ski race. “How did I get here? What am I doing? Am I insane?” Those and many other questions prowled the darker recesses of my psyche as I stood under a light snowfall on the frozen Chena River last March at the Sonot Kkaazoot. Take it from a man who loathed skiing two years ago. There are ways of avoiding this fate. I offer you a few pointers as a public service for those contemplating entering their first long distance race. I would never have found myself on the river last year if I hadn’t met a sequence of people. Every year my wife Julie and I are invited to a large caroling party. While Julie has a lovely voice mine is like a badly trained terrier, likely to wander off, heedless of commands. My strategy is to stand next to the strongest singer and mime the words. But two years ago I decided it might be better to just sample the Christmas punch and rest my eyes lying down on a distant couch. When I reached the couch though I found someone else had reached it first. Judging by outward appearances, Bill Husby seems harmless. He certainly welcomed me cheerily, shifting to make room, and once I settled in we engaged in some polite small talk. It turned out he helped groom the ski trails at Birch Hill. Moreover, it seemed he would then go for a ski after the grooming. “What, you mean after every grooming?” I was stupefied. With a deferential nod he agreed he did. I was sure I was sitting with one of those crazed, if harmless, people who stand on street corners with placards announcing the Mayan Apocalypse. Yet, there was something infectious about Bill’s enthusiasm for skiing, so I stayed and chatted with him until our wives collected us. It took several days before I realized Bill wasn’t so benign. Beneath his genial façade lurked the Nordic skiing equivalent of Typhoid Mary. I began slowly to entertain the bizarre thought there might be something to this cross-country skiing. Maybe taking a class in it was worth the money. It was a different man who greeted Bill Husby at the next Christmas caroling party. With soda water in hand I planted myself on the sofa regaling him with my new-found passion. When I had finally finished Bill innocently asked whether I heard of the SCUM. He explained the name stood for Susan’s Class of Uncoachable Men. He said they met, more or less casually, on Sunday mornings at Birch Hill to ski and pick up pointers. Well, I thought, he wasn’t wrong about skiing. It must be a safe group to join. Oddly, he was right. While I sat clutching the coffee mug and muttering to myself “Black Hole, Black Hole,” another part of me felt an odd glow of accomplishment. Maybe it was something the SCUM put in their coffee, but I found myself looking forward to the next week. Unlike my earlier expeditions with Julie, I had some technique to fall back on as I hurtled whimpering down a hill. Also, there is Susan Sugai, affectionately known as Mother SCUM. In the coming weeks she offered pointers on wax, on technique, on training, always pushing me a little past my comfort zone, always willing to answer a question. She explained part of SCUM etiquette included entering races and supporting trail maintenance. It turns out the Sonot Kkaazoot wasn’t that bad. Skiing folks are kindly. 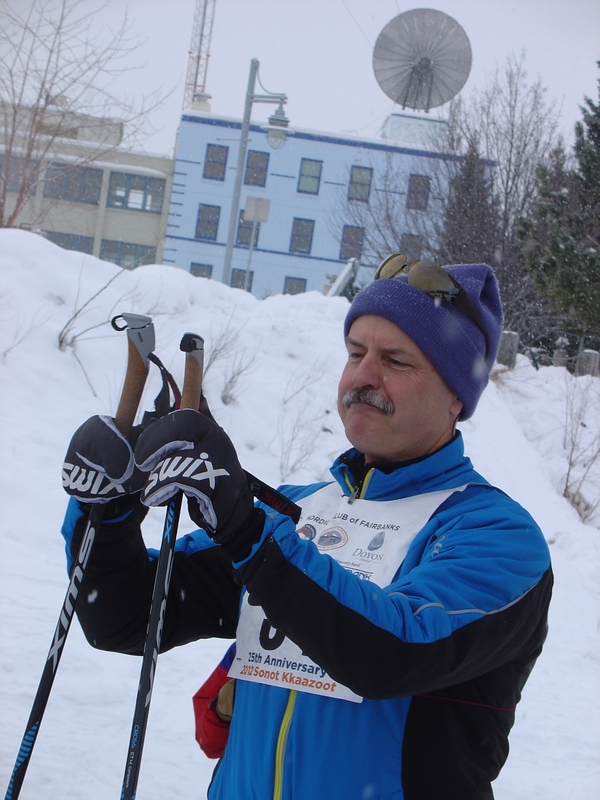 For the first 10 km, intentionally or not, Susan acted as a sort of wingman shepherding me along the Chena and into the hills, setting up an easy rhythm for the ski. Once we reached White Bear, she dipped her wings in farewell and engaged her after burners. I never saw her again, but by that time I was fine. Six hours after starting the race I crossed the finish line. Remarkably, I could still move my major muscle groups; I knew my name, where I lived and I could drive myself home. I may have even whistled a tune or two as I thought about the next year’s race.